Google Maps will require Android 3.0 or higher version. 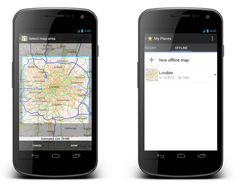 In a recent development, Google introduced the offline Google Maps for Android. The app in Google Play can be downloaded. A region in a map has to be selected and saved from more than countries for offline use. The Wi-Fi device will have to be carried while travelling internationally or travelling underground on the subway or restricting data usage. The Google Maps can be used in six large metros to find one’s way. “Make available offline” option has to be selected from the menu and the area that one likes to save needs to be verified. While if GPS is enabled on the phone than constantly a blue dot will indicate the current place without 3G or any data connections. A smoother and faster Compass Mode will also be released for street view within Google Maps for Android. Now the phone turns into a 360-degree, panoramic view of the outdoor or interior location through Business Photos. But to get a better experience, Android 3.0 or higher and a gyroscope sensor plus version 1.8.1 of Street view on Google Maps will be required.